It’s 1924, the Icelanders who arrived in 1875, have now been in Manitoba for 49 years. In1906, the railway has come to Gimli. WWI has been over for six years. The boom in demand for agricultural products from Iceland for the war effort in Europe is long over. The resulting hardship isn’t enough to restart the exodus to Amerika. However, conditions in a stratified society like England’s are still difficult for working class people. Lack of economic opportunity in Europe, political and religious persecution, rigidsocial structures, overpopulation, all make Europe a place of opportunity for shipping lines, railway lines, hotels, immigrant agents, land dealers and the government of Canada. The people who saw the vast numbers of people who wanted to leave Europe as an opportunity to make a lot of money, legally and illegally, were determined to attract as many customers as possible. If you’ve got steamships and Europe has potential passengers, you’ll do whatever you can to convince people they should emigrate. That’s a hard-edged sale’s pitch. England is over-crowded according to the steamship line hustlers, everyone agrees that emigration is the answer, the newspapers don’t just have a few letters to the editor about life in Canada. The newspapers are “teeming” with letters from successful emigrants. No letters, apparently, about the hardships, the disillusionment, the failure. Those successful emigrants are writing not just to the general public but to fellow countrymen who are toiling in cities that are over-crowded and in agricultural districts in England that are unproductive. 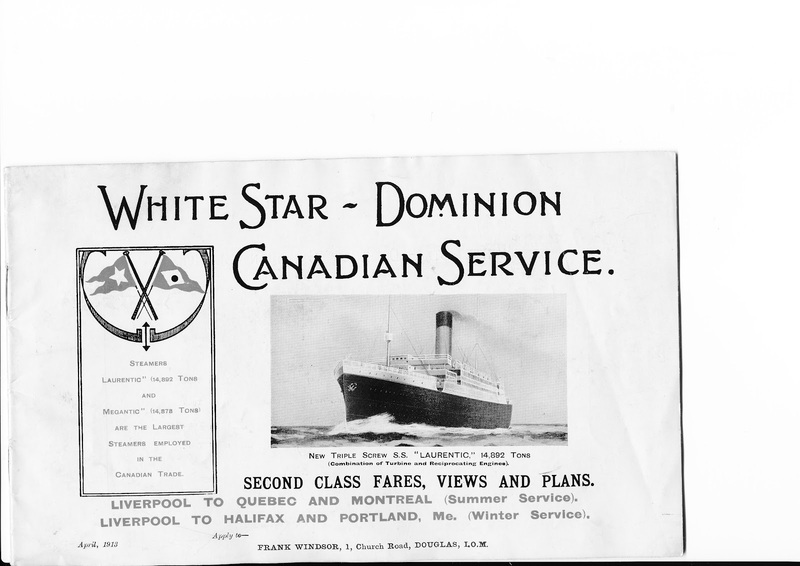 If that terrible picture of life in England and that rosy picture of life in Canada wasn’t enough to move you to rush out to buy a steamship ticket, the writer assures the reader that moving to Canada isn’t really such a big change. After all, Canada is no more, no less, than the Greater Britain on the other side of the Atlantic. When you emigrate, it will be just like being at home. People believed the letters in the papers, the advertising, the promotional materials. They did sell their houses, give up their rooms, sell off their belongings, seek out the local agent of the Steamship line and buy a ticket. All the letters sent back to England about the hardships in Canada are ignored. In Barry Broadfoot’s The Pioneer Years what comes out time and again is how completely unprepared people were for life on the Canadian prairies. In one reminiscence, the speaker says, “I landed at Quebec July1, with my five pounds, which is what the Canadian government said you had to have to land in their country. My ticket said Humboldt, Saskatchewan.” The speaker misses his train stop and goes two stops too far. He is so naïve that he wants to know if he can get a bus or a tram to take him back to Humbolt. He has to walk. In “No More Farming for Us” the speaker says that they’d left a good home in England. They’d left a cottage style house with 11 rooms and found themselves on the “bald prairie south of Battleford.” They manage to build a shack of 14 x 20 feet. When it is finished, they are having a picnic when the house catches fire. They save nothing. They move to the nearest town and the father gets a job. It doesn’t matter, of course, to the railway, the steamship companies, the immigration agents, the hotel owners, the suppliers of equipment. They’ve got the money for their services and goods. IF people survive, they’ll become customers shipping goods or receiving goods on the railway. They’ll be customers, each little family a source of profit and it will all add up to many fortunes for the few. There is, after all, collateral damage, when it comes to making a fortune. Lives ruined, lonely graves, but the great experiment did work. Just like soldiers are cannon fodder in war time and quickly forgotten when the war is over, the emigrants were cannon fodder for the making of fortunes. However, few went back because as hard as life was on the Canadian prairies, it was still better than what they had left. It’s 1924, the Icelanders who arrived in 1875, have now been in Manitoba for 49 years. 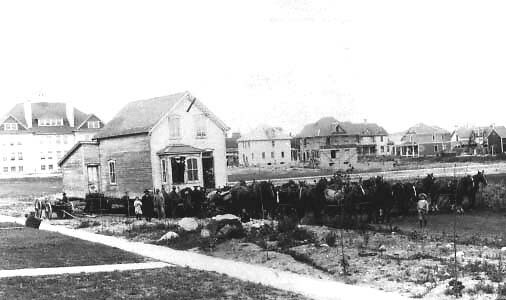 In 1906, the railway has come to Gimli. WWI has been over for six years. The boom in demand for agricultural products from Iceland for the war effort in Europe is long over. The resulting hardship isn’t enough to restart the exodus to Amerika. However, conditions in a stratified society like England’s are still difficult for working class people. Lack of economic opportunity in Europe, political and religious persecution, rigid social structures, overpopulation, all make Europe a place of opportunity for shipping lines, railway lines, hotels, immigrant agents, land dealers and the government of Canada. 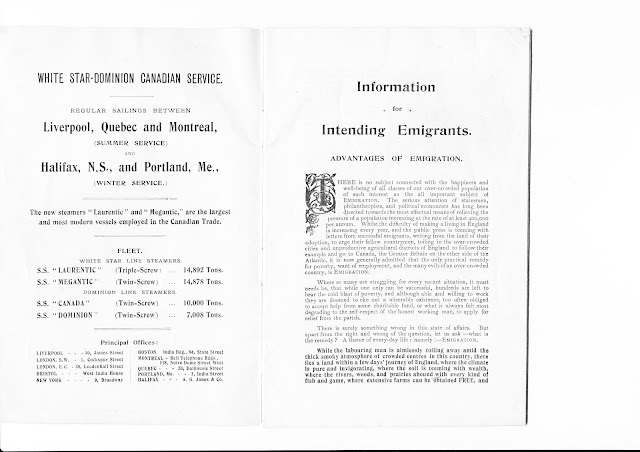 With the generous help of my friend, Jim Anderson, antique bookseller in Winnipeg, Manitoba, I have been able to copy a rare passenger line brochure intended for immigrants. It’s later than the time period when Icelanders were leaving Iceland to escape economic and social conditions. Still, it provides an interesting insight into part of the immigration process. These passengers aren’t being shut in the bowels of the ship with a herd of horses. You had to get to Liverpool, of course, and that could be quite a journey. In the summer, you had a choice of destination: Quebec City or Montreal. In winter, you could land at Halifax or Portland. The White Star-Dominion Line provided this small brochure to prepare you for Canada. I believe that my Irish grandmother came second class. Seasickness affected everyone, first, second class, steerage, but the first and second class passengers got to be seasick in much more comfort. Here is the front page. I’ve made it as large as I can X-large. It doesn’t seem very readable. I’ll see if the print can be darkened and made larger. SS Canada, Twin-Screw; SS Dominion, Twin-Screw. 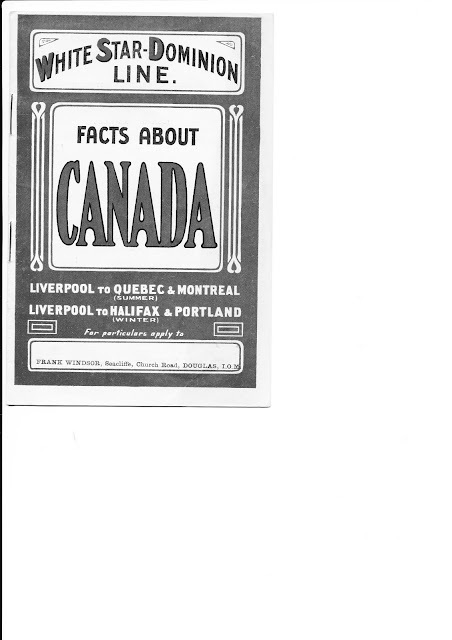 The principal offices are in Liverpool, London (2 locations), Briston, New York, Boston, Montreal, Quebec, Portland, Me., Halifax. 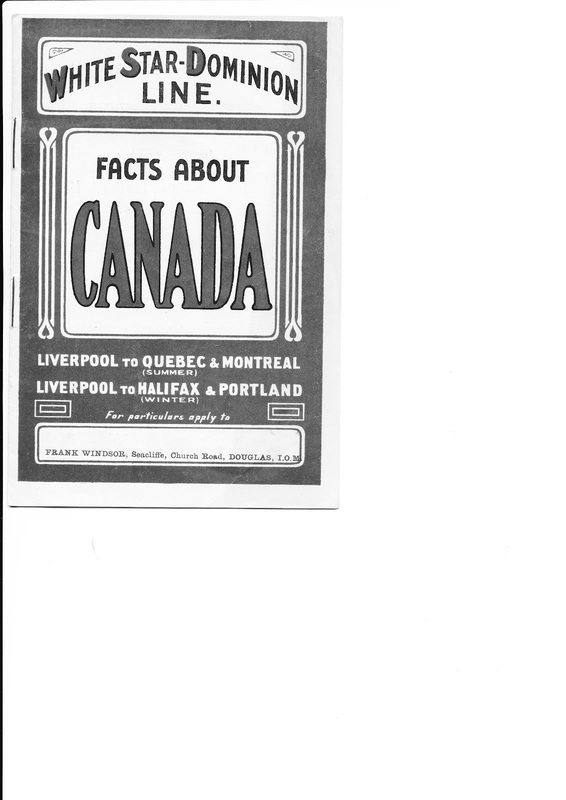 This brochure is, I believe from 1924. WWI has been over for six years. A lot of the Englishmen who had come to the prairies from around 1895 to 1914 (like my Irish grandfather) joined the army and were sent to France to die in the trenches. 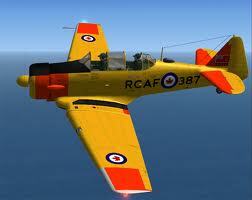 My grandfather survived, but just barely, and he returned to Winnipeg, Manitoba. A lot of the English settlers had no farming experience. They came from the cities and had held city jobs: cabinet makers, clerks, storekeepers, cobblers, butchers, factory workers. When WWI started it was an opportunity and an honorable reason to return to the UK. They wouldn’t be returning as failures. A lot of the men who volunteered to fight for England in WWI didn’t return. The casualties were horrendous. United Kingdom deaths are estimated at nearly a million with Canadian deaths at 67,000. In the meantime Canadian cities had grown. Winnipeg had gone from 42,000 in 1901 to 150,000 in 1913 to 194,350 in 1924. Immigrants were coming again. Immigration may have been desperate bids for political freedom, to escape dreadful economic conditions, but to the steamship lines, the railways, the immigration agents, it was just business. Vilhjlamer Valgardsson, the Vicious Viking of Vik, leaves the shores of Iceland to raid the coast of Europe, taking gold and slaves. 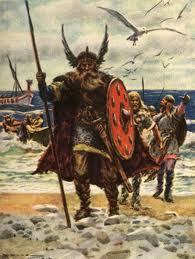 Vilhjalmer lands on the shore ready to lead his Viking warriors into battle. There will be no turning back. 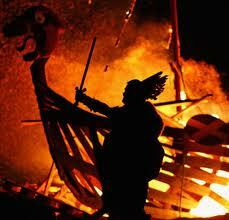 All is laid waste before the Viking onslaught. Berserkers lead the way. Billy, it’s time for supper. Something I’ve always appreciated about people of Icelandic background’s is their ability to laugh at themselves. Sharp witted poetry that deflates egos and reveals less than stellar behaviours have a long history. Vanity and foolishness have always been frequent targets. Story telling about community absurdities and individual idiosyncrasies are not exclusive to Icelandic society or culture. However, in my experience, such anecdotes, usually verbal, seem exceptionally common. When the settlers came to New Iceland, they were a homogeneous group. 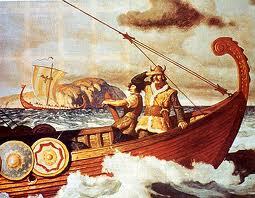 Until they got onto ships to go to England or Scotland, many people had never met someone who was not Icelandic. The port cities in the UK were a great shock. Letters written about the experience are well known. The large horses, the stone buildings, the travel by train, everything, everything was foreign. Quebec City must have been as strange to people who had spent their lives on isolated farms as some crazed fantasy. Always travelling, trusting to the agents you weren’t sure could be trusted, and sometimes were untrustworthy, by ship to England or Scotland, by train to the next port, by ship to Amerika, by more ships along the Great Lakes, up rivers, into endless wilderness. With people dying on the way, dying on ships, dying in ports, dying on ships travelling westward, dying on rivers, on barges, on wilderness beaches, in lonely cabins. In Iceland there were the trolls, the huldafolk, the ghosts, the witches and here, in the wilderness were the people they’d been warned about, the Indians, and with them came stories of Wendigo. There were violent, dangerous gods in the forests that were already terrifying, life threatening. And Wendigo. Who was Wendigo? He was more than one. They roamed the forest. They were humanlike dogs, evil, practicing cannibalism. If a person ate human flesh, he became a Wendigo. They knew no limits but were driven by gluttony, greed and excess. As part of the transformation caused by eating human flesh, they grew in size and, like a troll, became large. It is not hard to imagine in those early dark winters, huddled in crowded cabins, ill fed, hungry, surrounded by freezing temperatures, howling storms, people believing in Wendigo. A new country, new terrors. Even in a place called New Iceland, the integration has begun. Guttumor Guttormsson says in one of his essays that it was a joyous day when he got his first moccasins to replace his Icelandic shoes. Terror and comfort from a new culture. The story, though, is not about Wendigo tearing anyone to shreds and eating him. It’s about the foolishness of the community in squabbling over petty issues instead of working together. 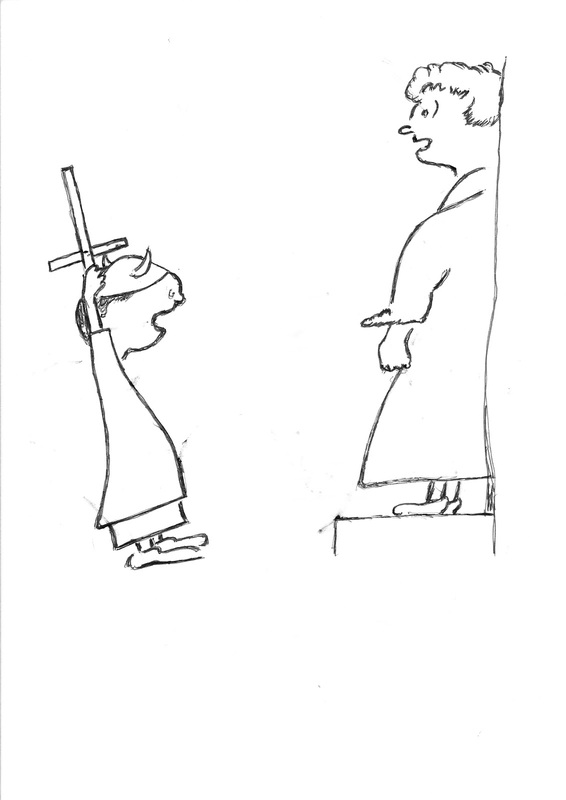 The early religious conflicts come to mind but there were other conflicts as well. Perhaps the amount of community conflict that existed was because in Iceland people lived on isolated farms instead of in villages. Each farm was its own community. As one farm owner in Iceland said, “I’m Emperor here.”, comparing himself to Napoleon. If farm owners were self-important little Napoleans, it’s no wonder that they were notorious for being in constant conflict. Visitors to Iceland commented on the amount of conflict between and among the farmers. Perhaps, it had to do with conditions further back in time with a society that could charge, arrest, convict but had no way of enforcing a sentence. That was left to whoever had reason to enforce it. Gunnar is not executed by a government executioner but is brought down by a vigilante posse. When I went to university, I did not know the difference between a discussion and an argument. What I had experienced was argument. 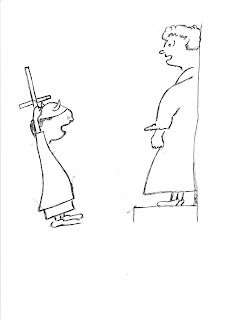 When people had different opinions, I was used to hearing adults arguing and the arguing often, especially if fueled by alcohol, turned to shouting and shouting to violence. Instead of reasoned discussion there was opinion, opinion often based on no facts. Instead of a sharing of opinion and information, there were entrenched positions which, if challenged, made the person with a different opinion, the enemy. It took some time before I realized the difference and that people could, with good reason, hold opinions different from mine and that, if I knew my subject matter, I might get them to modify their positions and vice versa. I learned that I didn’t have to be “right” all the time and that there was nothing sacred about my opinions. I also learned that I could work with people who had many different opinions than me: religious, political, social. In a larger way, this was the same struggle that the community in a multi-ethnic society was having to learn. This story has as a protagonist a young boy who is, in a dishonest and cowardly fashion, chosen by the men in the community to seek out Wendigo, to steal his cache of furs, furs that the community hopes will relieve them of their poverty. The choice of a young boy allows for his naiveté, for his bravery, for his innocence, for his being able to honestly report on what it is that he has learned. Innocence often reveals foolishness. It is a child who says the Emperor has no clothes. The community, in spite of its poverty, retains its pretensions, its vanities and its petty conflicts. The sheep farmers, in spite of all evidence to the contrary, stubbornly don’t move to a better, drier place to raise sheep but build rafts. The settlers away from the village are filled with fears and transfer them onto an imaginary villain. Through all these adult fears and weaknesses, the young boy has to search until he reaches an understanding of the community. Darlene and Ben Solmundson at work. My dad took me to Solmundson’s a couple of times. There were greenhouses and flowers, lots of flowers and both he and I were gardeners. Not poke a finger in the geranium pot gardeners, tens, hundreds and sometimes thousands of flowers, gardeners. This rough, tough commercial fisherman caught the bug from my Irish grandmother who could grow any plant any place. I swear she could grow roses on a bed of rock. My father grew vegetables and flowers and berries at his fish camp. He cut the grass and turned over the soil and everything grew like a jungle. The black bears liked to share in the strawberries. However, they and the moose weren’t interested in the pansies. Good plants, strong plants, strong stems, vigorous leaves, radiant flowers, that was what my father was after when he went shopping. 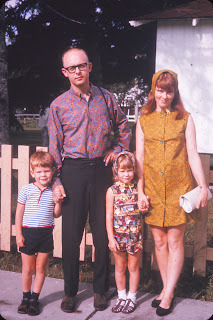 My father prowled the instant nurseries along McPhillip’s but he seldom bought anything. The stems were spindly, the leaves pale. The people attending the fenced in plants weren’t gardeners; they were temporary clerks hired to put water on the plants and take payments at the till. I’m not sure how my father found Solmundson’s Perennial Gardens. I’m not sure how anyone finds Solmundson’s Perennial Gardens. If you are heading down Hwy 8 from Winnipeg to Gimli, or from Gimli to Winnipeg, you turn West at a sign that says Kamarno. You don’t drive to Kamarno. You just head in that direction. There is a sign just before the driveway. You can also get there from highways 7 and 9. Just follow the Kamarno Road signs. It’s been awhile since my father gardened. Some years back, he went into the local nursing home, abandoning his beloved tiger lilies and giant delphiniums, his beds of onions and potatoes, his raspberry canes. He lived at the nursing home, looking out the windows at the green world. He eventually died there in a room with a narrow bed, a dresser, a chair. If he had died when he was young, it should have been in the midst of a violent storm on Lake Winnipeg, battling the elements, screaming defiance. If he had died before he had to go into a nursing home, it should have been in his garden, surrounded by his flowers. I mentioned to my cousin Dilla that I wanted some plants with which to make a roof garden that I could look at when I was writing. She said, “We’ll go to Solmundson’s.” I didn’t remember that I’d been there until we pulled into nursery driveway, then it came back to me. My father taking me there and my being fascinated by a hanging snap dragon that I’d never seen before. I liked it so much that when I got back to BC, I looked everywhere for it but with no luck. This time, I looked for it at and, sure enough, they had some so I had to buy a few to put into my roof top pots. Although Solmundson’s Perennial Gardens are nowhere near a town, people must know where they are. Darlene Solmundson tells me that she and Ben started the greenhouse business eighteen years ago and they’re still in business. She’d worked at a greenhouse down the road for a number or years, then the owner’s wife died and he quit. She mentioned to Ben there might be an opportunity to start their own business and her former employer let them use his place the first year to grow plants. They’d grow them there, then bring them back to their place to sell. The kids were small and a home based business suited the family just fine. Their farm originally belonged to Darlene’s mother and father, Victor and Anne Srutwa. Ben is from Gimli and is the son of Joe Solmundson. They started out with no greenhouses and now they have eight buildings. They start in February seeding, they heat up the buildings one at a time as each is needed. There is more to the greenhouse business than the summer season. There is a steady rhythm to Ben and Darlene’s lives. In August, as the current sales year starts to wind down, they will already be ordering cuttings for the following year. They open on Mother’s Day and stay open until the Thanksgiving weekend. They can extend their year like that because they carry shrubs and perennials. Their best sellers are stuffers. I can believe that because that’s what I was buying the three times I was there recently. With stuffers you can create instant gardens in hanging baskets and flower stands. They have a large demand for vegetable plants. It’s only June 21 and they are sold out of tomato plants. Part of that was due to the odd weather we’ve been having. There’d been warm weather, people bought tomato plants for early planting, then it froze and they had to buy more tomato plants. There’s a silver lining on every cloud. They carry transplants for things like squash and pumpkins. These they grow from seed. I picked up onions and celery because I like mixing vegetables and flowers in both pots and beds. I asked Darlene if she carried any exotics but she said no, they were not good sellers. People preferred the geraniums and the petunias. I can see why. The colours are beautiful. On my first trip and my second trip, I bought geraniums. But then, today, just as I was leaving, my friend, Nina Colwill, who had come with me, came out of a green house and said, look at this. It was a plant I didn’t recognize. It was a New Guinea impatiens. That’s the trouble with visiting green houses. I go to buy a few geraniums and end up buying something like a New Guinea impatiens. The colours were so brilliant that I just had to have one. The problem is that Darlene says it needs to be in the shade and rooftops aren’t big on shade. Maybe I can tuck it into a spot where it gets shade from the Manitoba Maple that hangs over the roof. It’ll provide a spot of intense red among the green leaves. I looked at my plants when I got them home. Strong stems, green leaves, carefully pruned, watered, fertilized, taken care of by people who care about plants. That’s good because people who care about plants like to buy from people who care about plants. I know, I’m of Viking stock. I should be in a Viking long boat raiding the shores of Lake Winnipeg, pillaging, but I am half Irish so maybe I could just pillage gardens. My grandmother did that. Pillaged gardens. She always carried little bags with some damp soil in them in her purse. When she saw a plant she envied, she snipped off a leaf and tucked it into one of the bags. She did that at Winnipeg’s City Park quite often. When she got the slip home, she nurtured it, grew it, enjoyed it. When we were leaving, Nina asked Darlene if she had any Virginia Creeper for sale. It was sold out but there was some growing over a shed. Darlene got her clippers out, cut a long piece, gave it to Nina and then showed her where to cut it (close to the budding nodes) and how to plant it. Now, that’s service. I’ve been thinking a lot lately about why I come to Gimli. That’s probably because my father died three years ago and my mother died last December. My family is out at the Coast, my sister-in-law, my niece, my nephew. My daughter is on the island with her family and my son and his family are just across the border in the States. A ferry ride and an hour’s drive and I’m at their front door. Now that my parents are gone, will I come back every summer as I have done for fifty-one years? I was brought up in Gimli. Did all those Gimli things. The Christmas concert at the Lutheran church, the orange and the bag of hard candy. Skating on the edge of Skorbahutch’s land where the railway spur and the track made a Y. Hunting rabbits in the brush piles. It took two of you. One to kick the brush pile, the other to shoot the rabbit that came running out. Skating on the outdoor rink, then indoors once the new rink was built. Curling. Lots of shouting by the skip and the sharp sound of the granite rocks hitting each other. Hanging around Mary’s restaurant. Sitting in the booths eating hamburgers and chips, not those things in bags but home made French fries drenched in vinegar and salt. Playing the pinball machine beside the front door, trying to get an edge by lifting it a little only to have it flash TILT. Later, sneaking into the pool room through the back door to shoot pea pool and snooker. Struggling through snow up to my knees to deliver The Winnipeg Free Press. I hated collection day because every time I went into a house to collect the money and give out the ticket that proved the subscriber had paid, my glasses fogged up. Solid white. It was like going from a freezer into a sauna at some places, then back into the freezer. I went to all the hockey games I could afford and when I had an extra quarter, I watched cartoons and News of the World and feature films in Greenberg’s theatre on Second Avenue. Fished on the outside of the dock for perch and swam in the harbour. There weren’t a lot of boats in those days and the water was still clean. I didn’t swim much because I was afraid of the water. Sometimes we went to the little dock and the other guys, the ones who loved the water, would dive all the way to the bottom and bring up stones to prove they’d been there. But what is it that brings us back from far places? When we left school there weren’t many opportunities in Gimli. 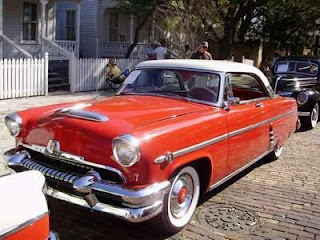 Some already had a plan, a goal or, like me, no plan, no goal, but grandparents in the city who wanted me to be something other than a laborer on the highway or a fisherman. Nowadays, it’s okay to be a fisherman but in those days my father would often fish for two months and come home owing more money than when he started. A lot of fishermen lived in shanties. Now, they live in mansions. We were all imposters of one kind or another, pretending we weren’t just small town kids who snuck in the back door. Maybe that’s partly why we come back to Gimli every summer. To be ourselves. To be the kid in the third seat in the window row in Miss Greenberg’s class. Or the best forward on the PeeWee hockey team or the best goalie for the Midgets. Or, maybe, just to be the kid who, after a good day’s fishing, goes home with fifteen golden perch on his string. When I got married and had a couple of kids, we used to go once a summer to have tea with Miss Stefansson. Miss Stefansson was very special. She was educated, sophisticated, and completely and totally dedicated to her students. She never married. We told each other stories about why that was. Given the kind of person she was, it had to be some tragedy in her past. We thought maybe it was a fiancée killed in WWI. I and my wife and kids went there and she made tea and we told her about ourselves, what we were doing, what we hoped for. Her house is gone now but when I walk past there, it is still there in my mind’s eye and I can still see us standing at the door and she is letting us in for our annual cup of tea and I’m going to tell her about my successes so she’ll know that the trouble she took with me was worthwhile. Maybe that’s it. Maybe it’s the memories. When I was in Iceland the first time, my host took me on a two day journey. He frequently stopped to point out places and explain why they were important. Sometimes it was just a rock but it was important because something important had happened there. Maybe Gimli is a bit like that. When I walk on the dock, a thousand earlier ghosts of myself walk with me. When I sit on the sand, I sit with endless overlapping memories of having sat there before. I sat there as a small child with my mother. I sat there later when I was old enough to come with boys my own age. I sat there as an adolescent with adolescent friends. I sat there with my wife. Then we sat there with our kids. A later, much later, I sat there with my grandkids. Sometimes, I say to people, “This happened here.” Or “That happened there.” But often I don’t tell anyone except myself. This is where I kissed a girl for the first time. Here is where we had our dances and we wore drapes and the girls wore poodle skirts and a scarf around their neck and we danced slow dances close together. The guys who were cool popped their collars and, if they could afford it, wore leather jackets. Here is where we spent lazy summer afternoons playing baseball. Here…. The community hall is gone now but it was there that we danced to music made for teenagers, music that scared some adults but not my parents. They were so young they thought the beat was great. Elvis, Fats Domino, Little Richard, Buddy Holly. Here is where we rocked and rolled. It was in Harold Bjarnason’s parent’s living room lying on the floor, watching TV that we saw Elvis sing with his hips cut off at the waist so we wouldn’t be driven into a sexual frenzy by his moving hips. Maybe, maybe, maybe. The memories are sharp, there are so many of them. The ages of the memories are all mixed up. The sound of a machine gun firing at the Gimli airbase when they had air force day. The hard, metallic, brutal sound of it. The sand around the target kicking up in spurts, the brass casings flying away from the gun, glinting in the sunlight. Being helped into a cockpit of a plane and sitting there imagining myself flying through the sky. Stopping a game of tin can cricket to watch a Harvard trainer diving down, straight down until it disappeared behind some trees. The game was on this piece of boulevard.It’s here we watched someone die. Maybe a life is more than the present or maybe it can be more than the present. If you are lucky, that is. There are, after all, those who disappear. They never come back or they come back for a day or two if someone dies, then they’re gone again. They live in the two dimensional world of the present. History makes life three dimensional, a world of overlapping sights and sounds and smells and feelings. If you’re lucky. If you walk down the street where you lived and it is all right for the remembered past and the present to become one. The Gimli train station of my childhood. First, the Icelandic settlers came by flat boat, towed until a storm caused the captain to cut the line. The awkward flotilla was meant to land at Riverton where there’d be shelter from the storms on the lake but, instead, ended up on the swampy, sandy shore of Willow Point. I cannot imagine a more inhospitable place to land. The sand bar that is Willow Point is open to the north wind that sweeps down from Hudson Bay. On the far side of this narrow strip is a lagoon. It provides a harbour but in high water the lake and the lagoon rise up from both sides. The sand bar itself is not tillable. The trees, when I was a child, were all scabby poplar, poor building wood and poor firewood. The marsh extended westward, only gradually rising, with even the land not underwater year around being boggy and soft. There was higher ground only a few miles north of Willow Point but with no boat to tow the barges, the settlers were trapped in an area exposed to wind from every side. The protection that would have been afforded by copses of spruce trees against both wind and drifting snow was close but not close enough. They hurriedly built crude cabins, one for every stove, and spent the winter crammed together, waiting for spring. The lake both, in open water and frozen over, was the first highway. The government then hired the settlers to cut a trail through the bush. Hard, unaccustomed work for men not used to cutting down trees, not used to using an axe, not used to thick bush. Travel was slow, only possible in good weather. Getting goods to the market in Winnipeg was difficult, sporadic, often impossible. But the Icelandic settlers had seen trains in Scotland. They’d seen the power of the railway and, in Eastern Canada the first public railway started in 1836. In 1856 there’s a railway between Toronto and Montreal. 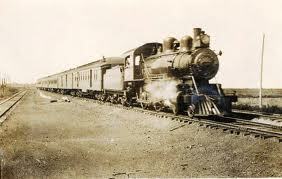 In 1863, the first railway is opened in western Canada. In 1871, four years before the Icelandic settlers arrived at Willow Point, British Columbia joined confederation. A stipulation was that a railway would be built to join the Pacific with the rest of Canada. The Icelandic Mormons had walked from the East Coast to Salt Lake City. People traveled by horse back, on wagons pulled by horses and oxen, in canoes and on sailboats and lake steamships but none were efficient in moving people and goods over great distances. In 1877, the Countess of Dufferin steam engine was brought to Winnipeg to help build the railway line. It is the first locomotive on the prairies. In 1878 the first train reaches Winnipeg. The railway owners saw settlers as their potential customers, receiving and sending goods, paying the railway in both directions. They know there are fortunes to be made. Drive from Winnipeg to Stonewall on Hwy 7. Look carefully at the land. High, not swampy, good to build on. Pay attention to the railway tracks. The railway reached Stonewall in 1881. That’s only six years after the Icelanders first landing on their windswept sandbar, only five years after they moved north to Gimli. Seventeen years later, in 1898, the railway reached Teulon. As you drive north, keep an eye on the land, on this high ridge created by Lake Agassiz. In 1907 the railway reached Kamarno. Nowadays, Kamarno is a handful of houses, a church, graveyard and a sculpture of a mosquito. But, in 1907, it was the end of the line, a place where goods could be picked up, where cordwood could be loaded for markets in Winnipeg. In 1910 the railway reached Arborg. Railways are all about markets. No market, no railway. Not a big enough market, no railway. They live or die on passengers and freight. No one builds a railway for the fun of it or because it might be convenient for someone. Railways are built for profit. They cost enormous amounts to build and run. Land, grading, steel tracks, railway ties, track laying. The railways in Canada wanted settlers, settlers who would take land in the area of the railway line. On the other side of the equation, settlers wanted railway lines. There was no point in producing goods: fish, grain, vegetables, cordwood, lumber, milk, cream, if it could not be shipped to a market that would buy it. To be bypassed was to be beggared. In 1883 the railway reached Selkirk. It wasn’t until 1903 that it reached Winnipeg Beach. That was five years after the railway reached Teulon. For three years, Winnipeg Beach was the end of the line. All goods from New Iceland needed to be taken to Winnipeg Beach so they could be shipped by rail. In my childhood, Winnipeg Beach was no longer the end of the line but the head start that it had got in 1903 had served it well. It had become an easily accessible summer resort. It had a boardwalk with rides and games. It had the Moonlight Special that brought people down to the large dance palace at the north end of the boardwalk. What it had lost was the business generated by people having to go there to ship produce to Winnipeg. 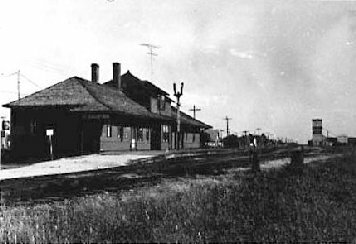 The railway reached Gimli in 1906. The trip to the station was shorter, the time it took for a horse and wagon loaded with goods was shorter. Gimli, now that it was just a train ride from the city, became a summer resort. The train didn’t just provide the local Icelanders an opportunity to ship goods but also the Ukrainian settlers who also supplied cordwood. It also meant a market created by the people who built cottages, a local market for fresh farm goods, vegetables and fruit, eggs, chickens, milk, cream and, from the fishermen, fresh fish. With no middleman. The summer campers who came on the train also provided work for tradespeople, for cooks and babysitters, for all those things that better off city folk in a summer cottage needed and wanted. Cordwood, though was the main cash producer. Winnipeg consumed vast amounts of wood for wood stoves and wood furnaces. The train was the cheapest and most efficient way to get it there. For a time the C.P.R. considered extending the Winnipeg Beach line to Arborg. However, if that was done, the railway would not have been extended to Gimli. Instead it would have run along the gravel ridge that is five miles west of Gimli. Michael Ewanchuk says that this news sent the Icelandic businessmen in Gimli into a panic. That’s not surprising. In recent years, we’ve seen how building a highway west of the small towns of New Iceland has meant that businesses shut down. Transportation is critical. There were two impediments two building the line from Winnipeg to Gimli. One was Willow Creek. The area on both sides of the creek was and is still marshy. Putting in a rail bed would be expensive. The other impediment was that there didn’t seem to be enough freight to support the line. The Icelanders appealed to the Premier of Manitoba, R. P. Roblin and when that didn’t work, they approached the Federal Government. That got them an approval for the line. If the rail line had gone from Winnipeg Beach to Arborg, there was a good chance that a spur line would have been built to Gimli, although building it might have been expensive because of the marshy ground. Without the railway, Gimli would not have prospered. It would not have become a summer resort. It would not have become a transport hub. It wouldn’t have got the WWII airport because a rail connection was essential for both materials and personnel. The airport provided both jobs and business. When the airport closed, there was, temporarily, an industrial park on the airport property. Today, there is a distillery just north west of Gimli. The daily passenger trains have long gone. Long rows of box cars are a thing of the past but the distillery still receives its supplies of materials by train. Team of horses moving house. You could move an entire town that way. Barry Broadfoot, in his book, The Pioneer Years, includes a reminiscence about what happened to two towns that the railway bypassed. They were called Mountain City and Nelson. They were going concerns. Mountain City had stores, businesses and two hotels. There were general stores and a hardware store, a grist mill, a sawmill, blacksmith, harness shop, schoolhouse, homes and, he says, “even a Presbyterian church.” After the railway bypassed Mountain City, people put the buildings on skids and hauled them to the railway line. No wonder the Gimli businessmen panicked. 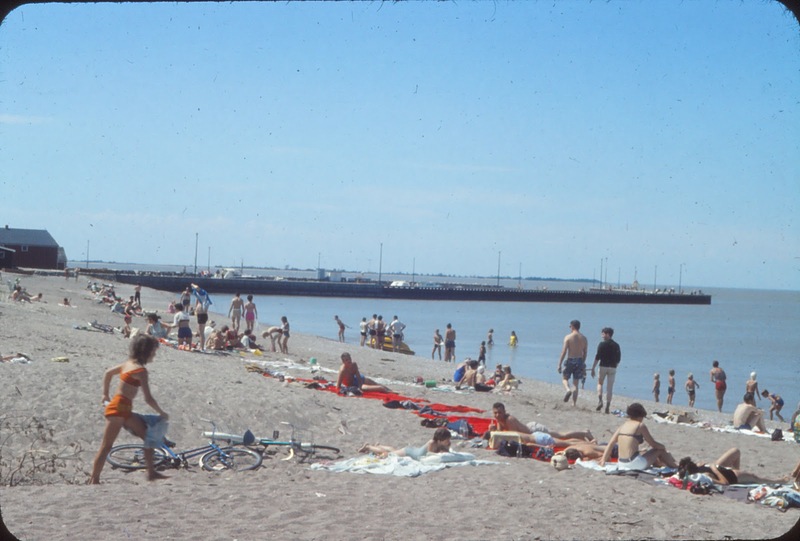 If the railway had gone from Winnipeg Beach to Arborg, it would have been necessary to put Gimli buildings on skids and move the town to a new site. Except, of course, Gimli was about fishing so the fishermen couldn’t move west. The summer cottagers wouldn’t have arrived. Who is going to build cottages at Gimli if it means getting off the train and having to take a long buggy ride to the beach? It is hard to imagine what would have become of Gimli without the railway. Eventually, good roads would have been built but they might have been a long time coming. What has brought me back to Gimli, Manitoba every summer since 1961? What has brought me back from Iowa, Missouri, and British Columbia for 51 years? This year’s Fjallkona, Connie Magnusson Shiminowski and her attendants. There’s the place, of course. Small town, Manitoba, but there are lots of small towns. Most of them are in decline or have already disappeared as farms have become bigger, farming equipment has got bigger, fewer people are needed to farm larger and larger areas. The people in Barry Broadfoot’s book of memories, The Pioneer Years, talk about how many people it took to break the land, sow the crops, build the houses. Pictures of harvest crews show a line up of fifteen men and, behind them, out of the picture, are all the women and children preparing food to feed them. Bull work. Physical work. Farming and fishing have needed fewer and fewer people to provide the harvests and the catches. Arnes, Hnausa, Finns, Camp Morton, have faded away. The local stores have shut down. The car is partly to blame. You used to have to have a store close by because a trip to town with a team and buggy or sleigh took a long time. Now, people think nothing of driving to Winnipeg for bargains at Costco, Superstore, the Shopping Malls. Some towns have been fortunate. Stonewall. The nearby federal prison provides steady employment. Other people’s tragedies are someone else’s silver lining. The town is within easy commuting distance to Winnipeg. The car taketh away and the car giveth. Teulon. Selkirk has turned into a city and is sluburba-ing toward Winnipeg. It’s had the steel mills. 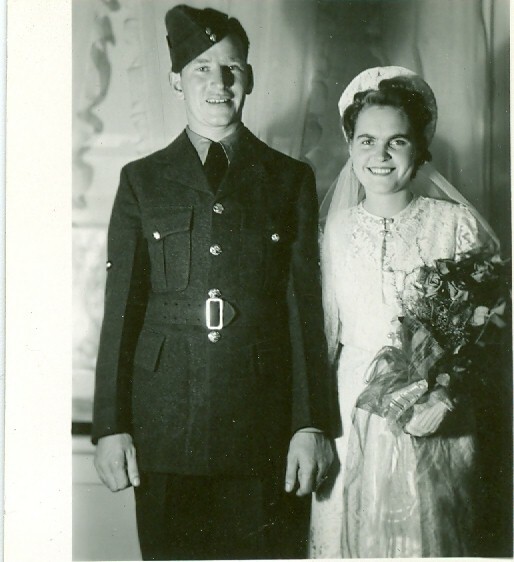 My aunt, Florence Valgardson and Jack Fowler on their wedding day in Gimli. Gimli has had it good. The WWII airbase. The Gimli girls didn’t have to go far for husbands, although once they married airmen, they began a lifetime of traveling. The airforce brought money into town. 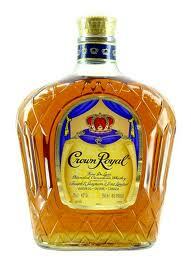 I got some of it as a pin boy at the bowling alley. Great beaches meant cottagers and cottagers meant grass needed cutting. I got some of that. The airbase finally shut down but the government eased the situation by helping create an industrial park. Then Gimli’s pristine water brought Seagram’s distillery and wine bottling plant. The wine bottling plant didn’t last but the distillery is still in operation. Good wages and benefits. Gimli started as an Icelandic settlement in 1875. The Ukrainians came later, around 1890. Now, the town’s origins are fading away. The Icelandic conversation in the stores has turned into an Icelandic conversation group that meets at Amma’s café once a week. The fish boats have largely been replaced by expensive pleasure craft. The fish processing sheds at the harbour have disappeared. The fish is shipped to the Fresh Water Marketing Board or filleted and sold locally. Nobody talks about it much but the Ukrainianness of Gimli has also faded away. Like the Icelanders, they’ve intermarried, the kids have left the farms and become doctors and lawyers and engineers and teachers in the city. A lot of culture is based on animosity. Us against them. It’s partly prejudice, fear, a need to feel exclusive, superior. However, it’s hard to keep up those feelings when your son in law or daughter in law is from some other ethnic, religious group, when your grandkids have married people from places you didn’t even know existed. You have to work hard at keeping the us in Us. There is still a Roman Catholic church, a Greek Catholic church, a Lutheran church, a Unitarian church. I grew up Lutheran so that’s the church I know about. The Ladies Aide that my mother belonged to has given up making sandwiches and dainties and serving food at funerals. The members are too old. That probably says it all. It’s not about being or not being Christian. 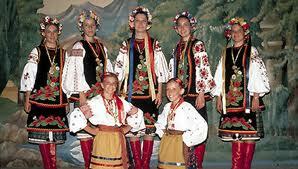 It’s about the exclusivity of community, about origins, about the old country. That’s pretty well faded away with the dying of my parents’ generation. My kids don’t see themselves as Icelandic or Irish or English. The grandkids even have a little German and Russian thrown in. They see themselves as Canadian. Or American. They’re not hyphenated anything. They’ll leave the ranting and raving, the comedy and tragedy of ethnic identity to new immigrants. New houses are going up regularly west of town. Strangers. Or not strangers, often people who had cottages and want to retire here. Or people who worked here for a time and want to come back. Gimli is a good place to retire. All the advantages of a small town but two good highways leading to Winnipeg and Walmart. If you’re that way inclined, you can go to see The Royal Winnipeg Ballet and drive home in the same evening. Or attend a hockey game. The town is small, a mile by half a mile. The lake on the east, the railway track on the west, deep government ditches on the north and south. Winter houses are replacing the cottages to the north and south. Small developments are appearing where there used to be farms along the lake. An enclave of expensive houses have appeared beside a golf course at Pelican Beach north of town. Birds of a feather, or, in cases like this, birds of a chequebook. The local council makes them pay through the nose for the privilege. Taxes are shockingly high. A friend of mine pays double what I pay in Victoria, BC for a house of about the same value. The Vikings believed a man had to have luck to succeed. Without it, intelligence and physical strength didn’t come to much. Gimli has luck. The first Icelandic celebrations were held in Winnipeg. They moved to Gimli. Hnausa, a small community to the north, also had an Icelandic celebration for a while but finally quit. Gimli was closer to Winnipeg on the rail line. Now, Islindingadagurinn is the event of the year. Figures vary about how many people come but the town is jammed with tourists looking for an Icelandic experience on the first long weekend in August. They bring money. Also, the Celebration provides a recognizable tourist identity. Part of Gimli having the Icelandic celebration is luck but, for twelve months every year, local people work at making it a success. It’s a strange mix. Icelandic settlement, Ukrainian settlement, fishing village, cottage country, WWII airbase, industrial park, home of excellent whiskey, bedroom community for Winnipeg. Maybe all of those things, plus lifetime friendships, are what draw many of us back to Gimli every summer. However, where other communities have disappeared or are just shadows of themselves, Gimli continues to prosper. Maybe it’s the sand beaches, the lake that reaches to the horizon, the history, the sunsets, the location. Maybe the Vikings were right. Maybe part of it is good luck. The skies threatened rain, grey clouds spread from horizon to horizon, but God loves Icelanders and the rain held off until the moment the ceremonies and speeches were finished. Just then, timed precisely, the first few drops could be felt. Crowds started to gather early. From a block away, it was possible to see the Fjallkona on the Manitoba Legislative steps. Her white headdress and her green robe provided a focal point. By the time I reached the Legislative patio, the Fjallkona (Connie Magnusson Schimnowski) looking regal in her costume) was sitting between her two daughters with Harley Jonasson in attendance. On one side was the Canadian flag, on the other, the Icelandic flag. One of the joys of these events is the gathering of the clan, people that one might otherwise not see from one year’s end to the next come together. Among these was Tim Samson, Dr. Ken Thorlakson, Keith Eliasson (from Riverton), Dilla Narfason (from Gimli), Vi Bjarnason-Hilton (with news of a group of 20 people leaving shortly for Iceland), Jim Anderson with his sister Sylvia (originally from Anderson’s Corner at Libau), Garry Oddleifsson, Peter Johnson (with the beautiful new brochure advertising Logberg-Heimskringla), Bryan Bjerring (Arnes), Einar and Rosalind Vigfusson (Arborg), Maria Bear (Selkirk), Raymond and Alma Sigurdson with their daughter Sandra (Willow Creek), Helga Malis (Gimli), Beverly and Einar Einarsson (Gimli), Linda Sigurdson-Colette. And lots more. Under lowering skies, the Kvennakór Garðabæjar choir lined up on the Legislative steps and entertained with songs in Icelandic. One of the joys of Icelandic culture is the numerousl Icelandic choirs. Most of the time the choirs are male or, perhaps, mixed but this choir, all female, had a delightful, different sound. After the choir finished their program, we all gathered at the Jón Sigurdsson statue. We gathered so efficiently, perhaps from past experience and knowing what we were doing, that we were ahead of schedule. We visited as we waited for His Honour, The Lieutenant Governor Phillip S. Lee and his wife, Her Honour Anita Lee. What a pleasure to have Phillip Lee for Lieutenant Governor I´ve been at many functions with him and he´s relaxed, friendly and, after attending many events that are Icelandic related, greatly improved with pronouncing impossible Icelandic names. Instead of pomp and ceremony built on self-importance, he is genuine and obviously enjoys people for at the end of the ceremonies, instead of having people stand while he retired, he stayed to mingle and talk to people. I’ve been to a lot of ceremonies over the years and many are dreadfully boring. This was not the case. The impending rain drove no one away. The speeches were short, often humorous, informative and heart-felt. The greetings from the dignitaries which can be deadly dull weren’t. They were interesting and fun. Maybe Guttormor is right when he says in his poems that we are important and the reason we know we are important is because we say so; however, an Icelandic sense of humour always pours a bit of salt on our egos to keep them from getting too big and what comes through is a genuine sense of how much we like each other and our community. Mr. Arni Thor Sigurdsson gave a good speech. The audience was pleased to hear about how Iceland’s economic situation is improving and how that Arni has visited the various Icelandic Canadian settlement areas and met relatives descended from Icelanders who immigrated to Canada. I may be accused of bias because Connie Magnusson Schimnowski is a cousin of mine (but then who isn’t a cousin?) but I think she makes a regal Fjallkona and, certainly, since the Maid of the Mountains is supposed to represent the accomplishments of the community, she is a good choice. Her work for the Icelandic Canadian community in Manitoba has been life-long and extensive. She has coupled that with volunteer work in the broader community. The formal ceremonies were over and rain began to fall. A bus provided by Bardal’s swished the officials away to the Winnipeg Art Gallery, then made repeated trips to pick up members of the audience. At the Art Gallery there was a presentation to Consul General Atli Ásmundsson and his wife, Þruður Helgadóttir. This was followed by a concert with more music from the Kvennakór Garðabæjar choir (conductor, Ingibjörg Guðjónsdóttir), followed by Björn Thoroddsen & the Björn Thoroddsen Trio. In a slight drizzle, slight because for the last few days Gimli has been being drenched by thunderstorms, an enthusiastic group gathered at the Gimli park for the beginning of the annual Kvennahlaup. Started in Iceland twenty-three years ago, the Women’s Walk has spread internationally. Today, there will be walks in cities and towns across Canada and in countries around the world. A fee is charged for participants, somewhere around $20.00 to $25.00. In return the participants get a t-shirt from Iceland, a medal, snacks and refreshments. Any profit left is donated to a charity. While the donation to charity is always a good outcome, it is obvious that the walk is about much more than that. Men are allowed to help with various tasks, but the walk is for women walking in solidarity with one another. In a society where discrimination and violence against women by men is still consistent and prevalent, the walk is a morale booster, a creator of group identity. In Egypt, women who paraded in the streets were physically attacked recently, a woman who drove a car (imagine that, she drove a car in Saudi Arabia, how evil is that? ), was imprisoned, female fetuses in places like China and India, are routinely aborted. Those wicked foreigners! Except in Canada female fetuses are also being aborted. Except it is in Canada where women went missing and the police weren’t interested until they were virtually forced to search the Pickton farm. It’s in Canadian papers that the reports of women being murdered by their husbands seem to never stop. The record of the RCMP with regard to the dreadful way they have treated female officers is so awful that one would think it was a report on some place in the Middle East. The military harbours Russell Williams, makes him a colonel, and when he is finally caught after having murdered two women, they burn his uniform but what do they do when women in the armed forces lodge a complaint that they have been sexually assaulted? A friend of mine won’t walk alone because, in the past, she’s had some bad experiences with aggressive men. We’ve moved ahead of some middle east countries where a woman can be condemned to death because she’s been raped, we’ve even started to grasp the idea that the victim shouldn’t be blamed, but we haven’t made violence against women, socially unacceptable, socially condemned. Kvennhalaup is great. It’s just a shame that a woman, by herself, can’t walk the same route in all these locations without being concerned for her safety. The turnout was good in spite of the rain but it would have been better if every woman in town had been there. My mother died recently at 90. She wasn’t able to be there in person but I had a feeling as I took photos, that she was there in spirit. And so were many women of her generation. So maybe the crowd was bigger than shows on film.